Notes: Blenkinsopp Castle is a fire-damaged, partly demolished 19th-century country mansion incorporating the ruinous remains of a 14th-century tower house located above the Tipalt Burn approximately one mile from Greenhead, Northumberland, England. It is a Grade I listed building and a Scheduled Ancient Monument.The ancient manor of Blenkinsopp was held by the eponymous Blenkinsopp family from the 13th century and they created a substantial tower house. A licence to crenellate the house was granted on May 6, 1340. An early account by Wallis, writing prior to 1769 and quoted by Rev. J. F. Hodgson, found "the west and north-west side of it protected by a very high cespititious wall and a deep foss - a vault going through it, north and south, 33 feet in length, and in breadth 18� feet: two lesser ones on the north side. The facing on the western wall has been down beyond the memory of any person yet living." ('Cespititious' in the above quote means 'turfy' or 'grass-covered', from the Latin 'caespes' meaning 'turf'.) A survey of 1541 reported the roof to be in decay and the tower not to be in good repair. 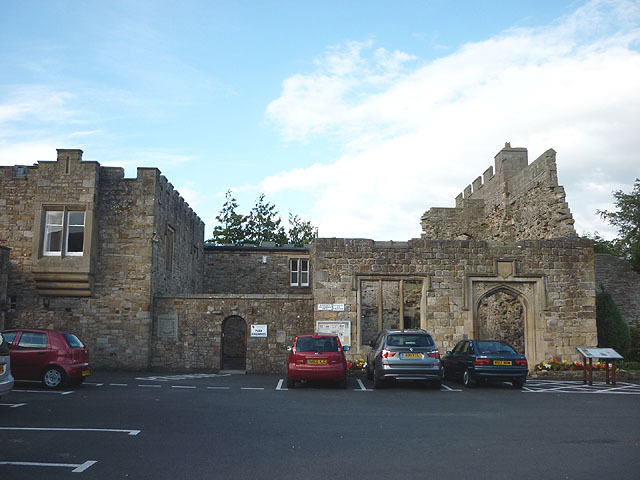 The family, whilst retaining ownership, granted possession to the Earl of Northumberland and abandoned the castle for their other nearby properties at Bellister Castle and Dryburnhaugh. In 1727 the heiress Jane Blenkinsopp married William Coulson of Jesmond. By 1832 the property was in disuse, and a mine agent's house was built adjoining the ruinous structure, probably by the architect John Dobson. In about 1877 William Blenkinsopp Coulson carried out a major restoration project which created a large mansion house on the site. Shortly after these works, the Coulsons sold all their Blenkinsopp estates to Edward Joicey. In the 20th century the mansion served as an hotel but major damage was caused in 1954 by a fire, and large parts of the property were demolished, on safety grounds. Today it is part home and part ruin.